Nothin’ But Blood was recorded at Biram’s home studio and Cacophony Studios in Austin, TX – the first time he recorded at an outside facility in several releases. The album features The Dirty Old One Man Band’s distinct songwriting cocktail, encompassing a penchant for sludge metal, the raw sucker punch of punk rock, profound truths of sentimental acoustic blues and country, the cleansing power of gospel hymns and spiritual ballads, and folk tales from the early 20th century. When you boil it all down in a simmering cauldron, Nothin’ But Blood is storytelling about wrongdoing and redemption. 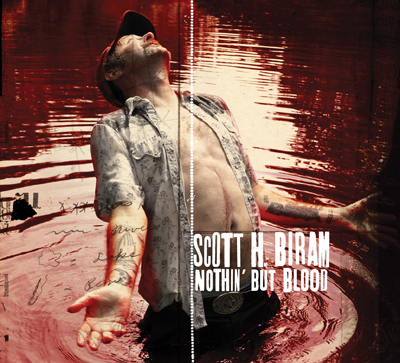 Scott H. Biram’s music is from the soul, for the soul, of the soul – and with this album, the spiritual buckshot lodges deeper than ever. In support of the new album, Scott will be touring nationwide in February and March with Larry and His Flask, with details to be announced soon.